Smart content alters the content displayed in a module depending on specific viewer characteristics. In addition to creating smart CTAs and smart forms, you can use rich text modules or coded modules to add smart content to your website pages, landing pages, and emails. Please note: if a contact meets more than one of your smart content rules, they'll see the content for the first rule that applies to them. You can also preview how your smart content will render for specific visitors. Please note: Country, device type, referral source, and preferred language can be chosen for contacts and customers as well as anonymous visitors. When you create smart content, keep best practices in mind. Start small and pick only one area of text to personalize to your visitors. Hover over the email and click Edit. 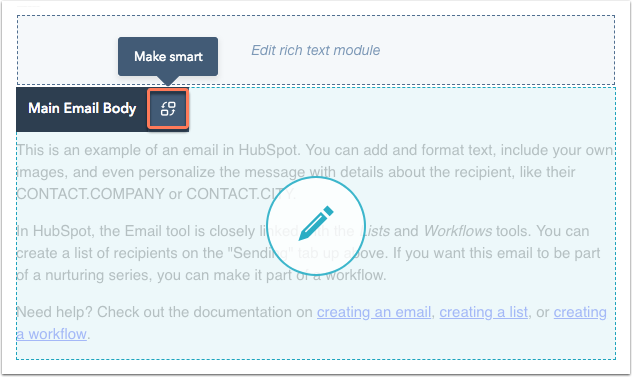 In the email editor, click the Main Email Body module, then click the Make smart icon. Please note: in marketing emails, you can only make rich text modules, including the main email body smart. Select a smart rule based on Contact list membership or Contact lifecycle stage. Because these emails are being sent to known contacts, you can't base your smart content criteria on anonymous information like device type or referral source. 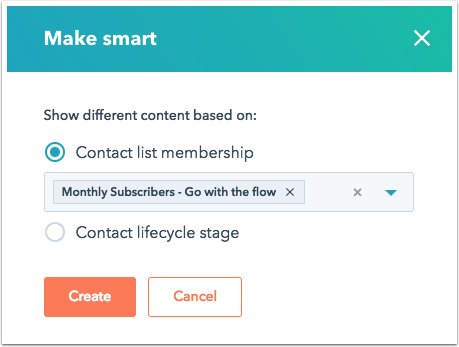 Click the dropdown menu to select specific lists or lifecycle stages to target in this smart rule. In the sidebar editor, click the Content dropdown menu to switch between your default text and your smart text. To add smart content rules, click Add rule. To change the order of your smart rules, click Reorder rules. To remove your smart rules, click Delete all rules. When you're done editing your smart text, click Save and go to module list. Before you send your email, you can preview how the smart text will render in your contact's inbox when sending a test email. When you're ready to send the email, click Send. Hover over an existing page and click Edit or create a new page by clicking Create new website / landing page in the top right corner. In the page editor, locate the rich text module you want to make smart and click the Make smart icon. In the sidebar editor, create your smart text. 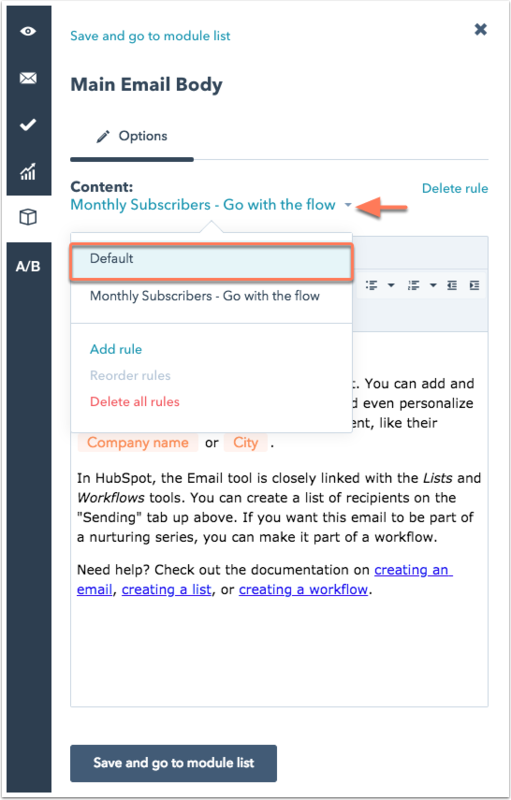 Click the Content dropdown menu to jump between your default text and your smart text. Before you publish the page, you can preview how the smart text will display. To open the preview pane, click the eye icon view iiiin the left sidebar menu. To preview the content this particular contact would see on your page, click the Preview as a specific contact dropdown menu and select a contact name. 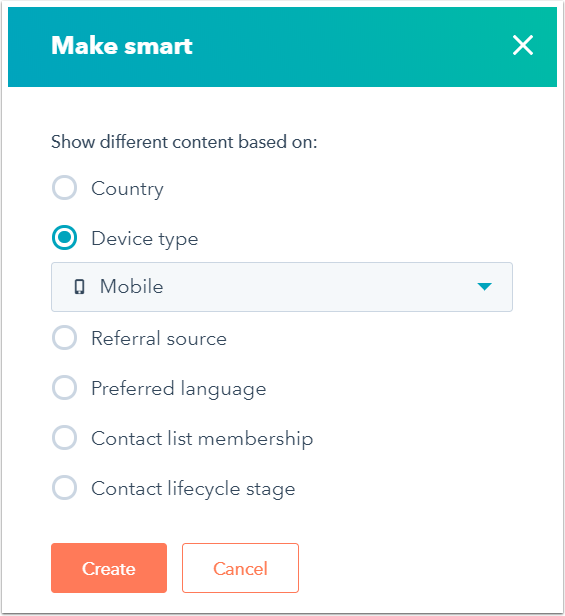 To test the smart rule behavior for anonymous rules, select the Preview page from a specific country, Preview page in a specific language, or Preview page from a specific traffic source checkbox. In the upper right, click Publish to take your smart text live. In the finder, select a template to edit. 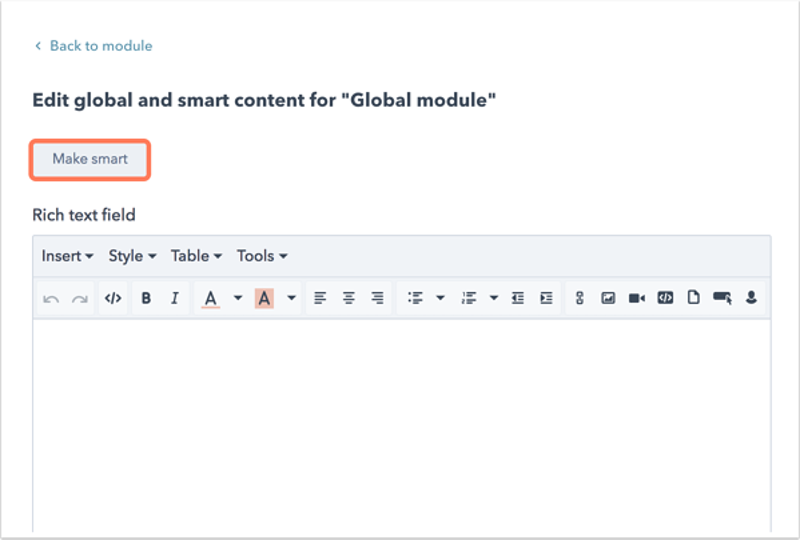 In the template editor, click the rich text module you want to make smart. In the module inspector, click the rich text content preview to expand the editor. Enter your smart text in the rich text editor. 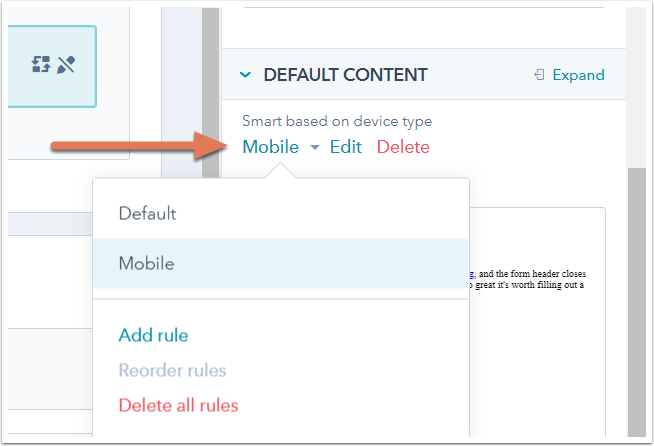 To switch between your default text and the text your smart rules will be based on, use the Smart based on contact lifecycle stage dropdown menu. In the finder, select your module to edit. 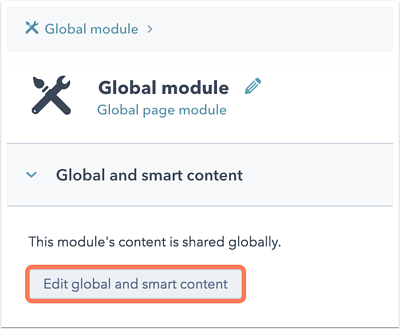 In the inspector, under Global and smart content, select Edit global and smart content. 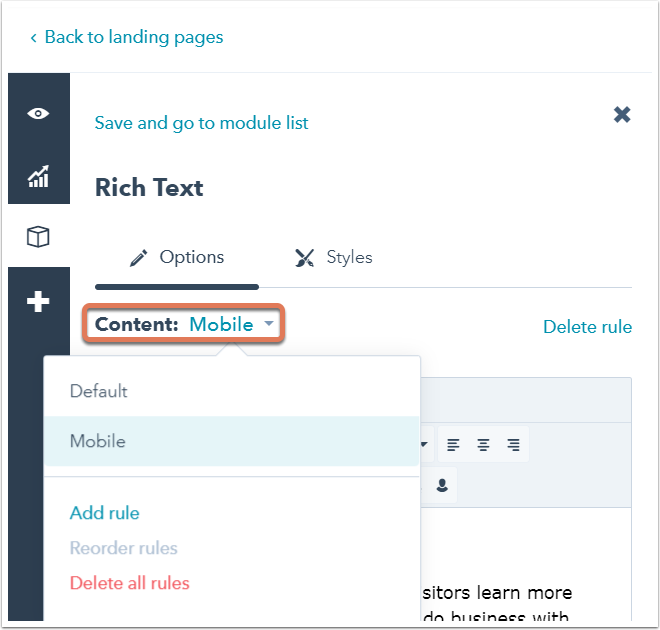 In the content editor, click Make smart to add smart rules to your default module content. In the dialog box, select the criteria you want to base your smart content rules on, then click Create. To switch between your smart content and the Default content, click the dropdown menu at the top of the editor.